According to BamS, German national Branko Weitzmann describes the daily half hour, weekly splash around with dolphins as “dolphin therapy”. Situated in the Tunisian Friguia Park the therapy costs around 1500 Euros plus travel expenses. What most people don’t realise is that the dolphins have a painful past. The wild animals in Tunisia originate from a brutal hunt which takes place in a cove in Taiji, Japan. A few years ago the film documentary The Cove, premiered at the Oscars, exposed the dolphin massacre. Since then the yearly blood spectacle has received worldwide condemnation. Health insurance will rarely pay for dolphin therapy, because the medical healing effects have not been scientifically proven, so most people resort to fundraising, without knowing that dolphin therapy promotes the suffering of dolphins held in captivity. Christa K, mother of a handicapped child, spoke to the WDSF: “I think some parents would benefit greatly not putting their energy into a sponsored marathon but instead privately with their children, on holiday without dolphins. 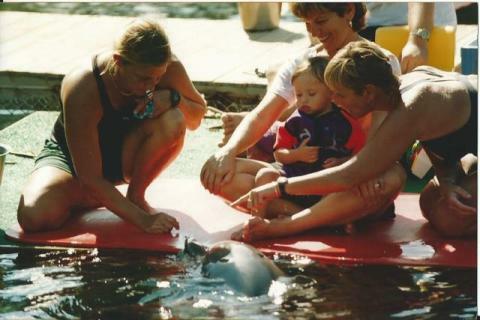 To this day my son never says “mama” to me, despite having this type of therapy at the “dolphin aid” organisation. A long term scientific study about dolphin therapy at the Julius-Maximilians-Universität in Würzburg has shown that parents only perceived a temporary change occurring in the young patients. In a review of the published study the private lecturer Christian Schulze, of Ruhr University Bochum, missed the animal protection aspect, speaking of avoidable methodological defects and the suspicion of contract work. 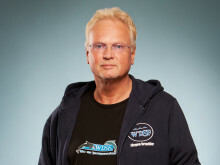 The marine biologist and author Karsten Brensing advises us against dolphin therapy. Brensing points out the significant risk of direct contact with marine mammals, in particular the dolphin, which is “hardly a predictable wild animal”.